Shakespeare’s King Lear challenges us with the magnitude, intensity, and sheer duration of the pain that it represents. Its figures harden their hearts, engage in violence, or try to alleviate the suffering of others. Lear himself rages until his sanity cracks. What, then, keeps bringing us back to King Lear? For all the force of its language, King Lear is almost equally powerful when translated, suggesting that it is the story, in large part, that draws us to the play. The play tells us about families struggling between greed and cruelty, on the one hand, and support and consolation, on the other. Emotions are extreme, magnified to gigantic proportions. We also see old age portrayed in all its vulnerability, pride, and, perhaps, wisdom—one reason this most devastating of Shakespeare’s tragedies is also perhaps his most moving. The play we call King Lear was printed in two different versions in the first quarter of the seventeenth century. The second version to see print is found in the First Folio of Shakespeare’s plays, published in 1623 (“F”). Entitled simply The Tragedie of King Lear, F contains over 100 lines that are not in Q1; at the same time F lacks about 300 lines (including a whole scene, 4.3) that are present in Q1. Many of the lines unique to Q1 or to F cluster together in quite extensive passages. The Q1 and F versions also differ from each other in their readings of over 800 words. In spite of the wide differences between the quarto and Folio printings, there is, nevertheless, such close agreement in punctuation between Q2 and F on some pages that the suspicion arises that the F typesetters may have referred to Q2 even if their copy was a manuscript. Thus when F agrees with Q2 against Q1, editors sometimes suspect that F may have been led into error by Q2 (see, for example, in the textual notes 1.4.32, 141; 2.1.141; 2.2.165; 4.2.74, 96; 4.6.299; 4.7.68; 5.3.186). In other cases, however, F agrees with Q2 in the correction of obvious (or nearly obvious) errors in Q1 (see, for example, in the textual notes 1.1.163; 1.4.327; 1.5.8; 2.1.13SD, 63; 2.2.98, 152, 163, 171; 2.4.121; 186, 246; 3.3.3; 3.7.90; 4.1.10; 4.2.18; 4.4.30; 4.5.8; 4.6.49, 53, 85, 100, 127, 286; 5.1.63; 5.2.5SD; 5.3.30SD, 365, 370). Title page of the First Quarto of King Lear, 1608 (facsimile). From the 1623 First Folio. Since early in the eighteenth century, editors have combined Q1 and F to produce what is termed a “conflated text.” But it is impossible in any edition to combine the whole of the two versions, because they often provide alternative readings that are mutually exclusive; for example, when Q1 has the earl of Gloucester in his first speech refer to Lear’s planned “division of the kingdoms,” the Folio prints the singular “kingdom.” In such cases (and there are a great many such cases), editors must choose whether to be guided by Q1 or by F in selecting what to print. 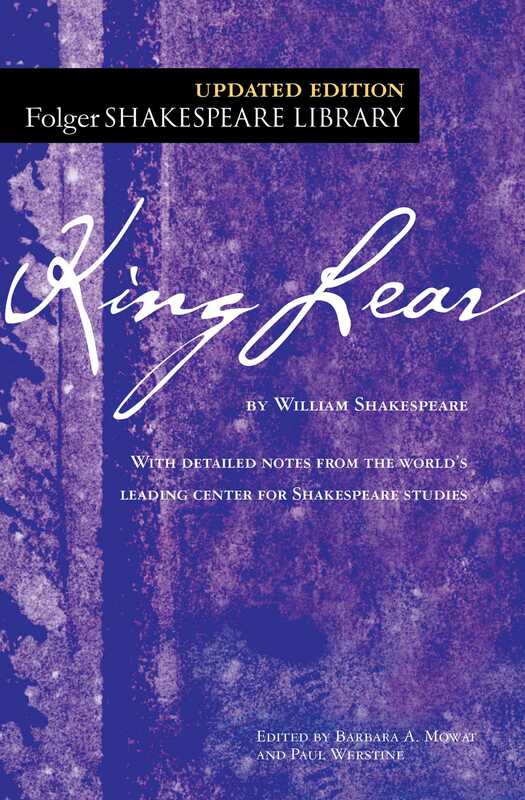 Twentieth-century editors of Shakespeare made the decision about which version of King Lear to prefer according to their theories about the origins of the early printed texts. For the greater part of the century, editors preferred F to Q1 in the belief that the Q1 text originated either in a shorthand transcription of a performance or in a reconstruction of the play by actors who depended on their memories of their parts. On the other hand, the F text was believed to have come down to us without the intervention of shorthand or memorial reconstruction. In the past few decades, however, Q1 has found more favor with some editors according to a theory that it was printed directly from Shakespeare’s own manuscript and that F was set into type from a version of the play that had been rehandled by another dramatist after Shakespeare’s retirement from the theater. This second theory is today in competition with yet a third theory that holds that Q1 and F are distinct, independent Shakespearean versions of the play that ought never to be combined with each other in an edition. Those who hold this third theory think that Q1 was printed from Shakespeare’s own manuscript, but they also think that the F text is the product of a revision of the play by Shakespeare after the printing of Q1. Nevertheless, as scholars reexamine all such narratives about the origins of the printed texts, we discover that the evidence upon which they are based is questionable, and we become more skeptical about ever identifying with any certainty how the play assumed the forms in which it was printed. The present edition is based upon a fresh examination of the early printed texts rather than upon any modern edition.I It offers its readers the Folio printing of King Lear.II But it offers an edition of the Folio because it prints such Q1 readings and such later editorial emendations as are, in the editors’ judgments, necessary to repair what may be errors and deficiencies in the Folio. Furthermore, the present edition also offers its readers all the passages and a number of the words that are to be found only in Q1 (and not in F), marking them as such (see below). Sometimes Q1 readings are substituted for F words when a word in F is unintelligible (i.e., not a word) or is incorrect according to the standards of that time for acceptable grammar, rhetoric, idiom, or usage, and Q1 provides an intelligible and acceptable word. Examples of such substitutions are Q1’s “fathers” (modernized to “father’s”) for F’s “Farhers” (1.2.18), Q1’s “your” for F’s “yout” (2.1.122), Q1’s “possesses” for F’s “professes” (1.1.82), or Q1’s “panting” for F’s “painting” when Oswald is referred to as “half breathless, ⟨panting⟩” (2.4.36). (Compare substitutions from Q1 at 1.1.5, 72, 176, 259; 1.4.1, 51, 164, 182, 203; 2.1.2, 61, 80, 92, 101–2, 144; 2.2.0SD, 23, 82, 83, 131, 141, 166, 187; 2.3.4, 18, 19; 2.4.8, 12, 39, 65, 82, 144, 146, 212; 3.2.3; 3.4.12, 51, 56, 57, 97, 123; 3.5.26; 3.6.73; 4.1.65; 4.2.91; 4.4.3, 12SP, 20; 4.6.22, 77, 102, 180, 300; 4.7.0SP, 15SP; 5.1.52, 55; 5.3.82SP, 99, 101, 118, 160, 163, 177, 308.) We recognize that our understanding of what was acceptable in Shakespeare’s time is to some extent inevitably based upon reading others’ editions of King Lear, but it is also based on reading other writing from the period and on historical dictionaries and studies of Shakespeare’s grammar. Finally, we print a word from Q1 rather than from F when a word in F seems at odds with the story that the play tells and Q1 supplies a word that coheres with the story. For example, when Lear enters at the beginning of 2.4 he wonders, in F, why Cornwall and Regan did “not send back my Messengers.” But, as far as we know, Lear has sent only a single messenger (Kent) to Cornwall and Regan. Therefore, like most other editors, we print Q1’s “messenger” for F’s “Messengers.” (Compare 1.1.214 and 5.3.193.) Because we rarely substitute Q1 words for F’s, our edition is closer to F than are most other editions of the play available today. (1) All the words in this edition that are printed only in the First Quarto but not in the Folio appear in pointed brackets (⟨ ⟩). (2) All full lines that are found only in the Folio and not in the First Quarto are printed in brackets ([ ]). (3) Sometimes neither the Folio nor the First Quarto seems to offer a satisfactory reading, and it is necessary to print a word different from what is offered by either. Such words (called “emendations” by editors) are printed within half-brackets (< >). In this edition, whenever we change the wording of the Folio or add anything to its stage directions, we mark the change. We want our readers to be immediately aware when we have intervened. (Only when we correct an obvious typographical error in the First Quarto or Folio does the change not get marked in our text.) Whenever we change the Folio or Quarto’s wording or change their punctuation so that meaning is changed, we list the change in the textual notes at the back of the book. Those who wish to find the Quarto’s alternatives to the Folio’s readings will be able to find these also in the textual notes. For the convenience of the reader, we have modernized the punctuation and the spelling of both the Folio and the First Quarto. Thus, for example, our text supplies the modern standard spelling “father’s” for the Quarto’s spelling “fathers” (quoted above). Sometimes we go so far as to modernize certain old forms of words; for example, when a means “he,” we change it to he; we change mo to more and ye to you. But it is not our practice in editing any of the plays to modernize forms of words that sound distinctly different from modern forms. For example, when the early printed texts read sith or apricocks or porpentine, we have not modernized to since, apricots, porcupine. When the forms an, and, or and if appear instead of the modern form if, we have reduced and to an but have not changed any of these forms to their modern equivalent, if. We also modernize and, where necessary, correct passages in foreign languages, unless an error in the early printed text can be reasonably explained as a joke. We correct or regularize a number of the proper names, as is the usual practice in editions of the play. For example, the Folio’s spellings “Gloster” and “Burgundie” are changed to the familiar “Gloucester” and “Burgundy”; and there are a number of other comparable adjustments in the names. Whenever it is reasonably certain, in our view, that a speech is accompanied by a particular action, we provide a stage direction describing the action. (Occasional exceptions to this rule occur when the action is so obvious that to add a stage direction would insult the reader.) Stage directions for the entrance of characters in mid-scene are, with rare exceptions, placed so that they immediately precede the characters’ participation in the scene, even though these entrances may appear somewhat earlier in the early printed texts. Whenever we move a stage direction, we record this change in the textual notes. Latin stage directions (e.g., Exeunt) are translated into English (e.g., They exit). We expand the often severely abbreviated forms of names used as speech headings in early printed texts into the full names of the characters. We also regularize the speakers’ names in speech headings, using only a single designation for each character, even though the early printed texts sometimes use a variety of designations. Variations in the speech headings of the early printed texts are recorded in the textual notes. In the present edition, as well, we mark with a dash any change of address within a speech, unless a stage direction intervenes. When the -ed ending of a word is to be pronounced, we mark it with an accent. Mak’st thou this shame thy pastime? However, when there are a number of short verse lines that can be linked in more than one way, we do not, with rare exceptions, indent any of them. The notes that appear in the commentary linked to the text are designed to provide readers with the help that they may need to enjoy the play. Whenever the meaning of a word in the text is not readily accessible in a good contemporary dictionary, we offer the meaning in a note. Sometimes we provide a note even when the relevant meaning is to be found in the dictionary but when the word has acquired since Shakespeare’s time other potentially confusing meanings. In our notes, we try to offer modern synonyms for Shakespeare’s words. We also try to indicate to the reader the connection between the word in the play and the modern synonym. For example, Shakespeare sometimes uses the word head to mean “source,” but, for modern readers, there may be no connection evident between these two words. We provide the connection by explaining Shakespeare’s usage as follows: “head: fountainhead, source.” On some occasions, a whole phrase or clause needs explanation. Then we rephrase in our own words the difficult passage, and add at the end synonyms for individual words in the passage. When scholars have been unable to determine the meaning of a word or phrase, we acknowledge the uncertainty. Biblical quotations are from the Geneva Bible (1560), with the spelling and punctuation modernized. I We have also consulted a computerized text of the First Folio provided by the Text Archive of the Oxford University Computing Centre, to which we are grateful. Also of great value was Michael Warren’s The Complete King Lear (Berkeley: University of California Press, 1989). II We choose F not because we believe that it stands in closer relation to Shakespeare than Q1 (we do not think it possible to establish which of Q1 or F is closer to the historical figure Shakespeare) but because F is a “better” text than Q1 in that it requires an editor to make fewer changes to its line division and wording than an editor must make to Q1. In recent years, ways of dealing with Shakespeare’s texts and with the interpretation of his plays have been undergoing significant change. This edition, while retaining many of the features that have always made the Folger Shakespeare so attractive to the general reader, at the same time reflects these current ways of thinking about Shakespeare. For example, modern readers, actors, and teachers have become interested in the differences between, on the one hand, the early forms in which Shakespeare’s plays were first published and, on the other hand, the forms in which editors through the centuries have presented them. In response to this interest, we have based our edition on what we consider the best early printed version of a particular play (explaining our rationale in a section called “An Introduction to This Text”) and have marked our changes in the text—unobtrusively, we hope, but in such a way that the curious reader can be aware that a change has been made and can consult the “Textual Notes” to discover what appeared in the early printed version. Current ways of looking at the plays are reflected in our brief introductions, in many of the commentary notes, in the annotated lists of “Further Reading,” and especially in each play’s “Modern Perspective,” an essay written by an outstanding scholar who brings to the reader his or her fresh assessment of the play in the light of today’s interests and concerns. As in the Folger Library General Reader’s Shakespeare, which the New Folger Library Shakespeare replaces, we include explanatory notes designed to help make Shakespeare’s language clearer to a modern reader, and we hyperlink notes to the lines that they explain. We also follow the earlier edition in including illustrations—of objects, of clothing, of mythological figures—from books and manuscripts in the Folger Shakespeare Library collection. We provide fresh accounts of the life of Shakespeare, of the publishing of his plays, and of the theaters in which his plays were performed, as well as an introduction to the text itself. We also include a section called “Reading Shakespeare’s Language,” in which we try to help readers learn to “break the code” of Elizabethan poetic language. For each section of each volume, we are indebted to a host of generous experts and fellow scholars. The “Reading Shakespeare’s Language” sections, for example, could not have been written had not Arthur King, of Brigham Young University, and Randal Robinson, author of Unlocking Shakespeare’s Language, led the way in untangling Shakespearean language puzzles and shared their insights and methodologies generously with us. “Shakespeare’s Life” profited by the careful reading given it by S. Schoenbaum; “Shakespeare’s Theater” was read and strengthened by Andrew Gurr, John Astington, and William Ingram; and “The Publication of Shakespeare’s Plays” is indebted to the comments of Peter W. M. Blayney. We, as editors, take sole responsibility for any errors in our editions. We are grateful to the authors of the “Modern Perspectives”; to Leeds Barroll and David Bevington for their generous encouragement; to the Huntington and Newberry Libraries for fellowship support; to King’s University College for the grants it has provided to Paul Werstine; to the Social Sciences and Humanities Research Council of Canada, which provided him with Research Time Stipends; to R. J. Shroyer of Western University for essential computer support; and to the Folger Institute’s Center for Shakespeare Studies for its fortuitous sponsorship of a workshop on “Shakespeare’s Texts for Students and Teachers” (funded by the National Endowment for the Humanities and led by Richard Knowles of the University of Wisconsin), a workshop from which we learned an enormous amount about what is wanted by college and high-school teachers of Shakespeare today. In preparing this preface for the publication of King Lear in 1993, we wrote: “Our biggest debt is to the Folger Shakespeare Library: to Werner Gundersheimer, Director of the Library, who has made possible our edition; to Jean Miller, the Library’s Art Curator, who combed the Library holdings for illustrations, and to Julie Ainsworth, Head of the Photography Department, who carefully photographed them; to Peggy O’Brien, Director of Education, who gave us expert advice about the needs being expressed by Shakespeare teachers and students (and to Martha Christian and other ‘master teachers’ who used our texts in manuscript in their classrooms); to the staff of the Academic Programs Division, especially Paul Menzer (who drafted ‘Further Reading’ material), Mary Tonkinson, Lena Cowen Orlin, Molly Haws, and Jessica Hymowitz; and, finally, to the staff of the Library Reading Room, whose patience and support have been invaluable. As we revise the play for publication in 2015, we add to the above our gratitude to Michael Witmore, Director of the Folger Shakespeare Library, who brings to our work a gratifying enthusiasm and vision; to Gail Kern Paster, Director of the Library from 2002 until July 2011, whose interest and support have been unfailing and whose scholarly expertise continues to be an invaluable resource; to Jonathan Evans and Alysha Bullock, our production editors at Simon & Schuster, whose expertise, attention to detail, and wisdom are essential to this project; to the Folger’s Photography Department; to Deborah Curren-Aquino, for continuing superb editorial assistance; to Alice Falk for her expert copyediting; to Michael Poston for unfailing computer support; to Anna Levine; and to Rebecca Niles (whose help is crucial). We are grateful to Leslie Thomson and Roslyn L. Knutson for theater history expertise. Among the editions we consulted, we found René Weis’s Parallel Text Edition (2010) and R. A. Foakes’s Arden edition (1997) especially useful. Finally, we once again express our gratitude to the late Jean Miller for the wonderful images she unearthed, to Stephen Llano for twenty-five years of invaluable assistance as our production editor, and to the ever-supportive staff of the Library Reading Room.